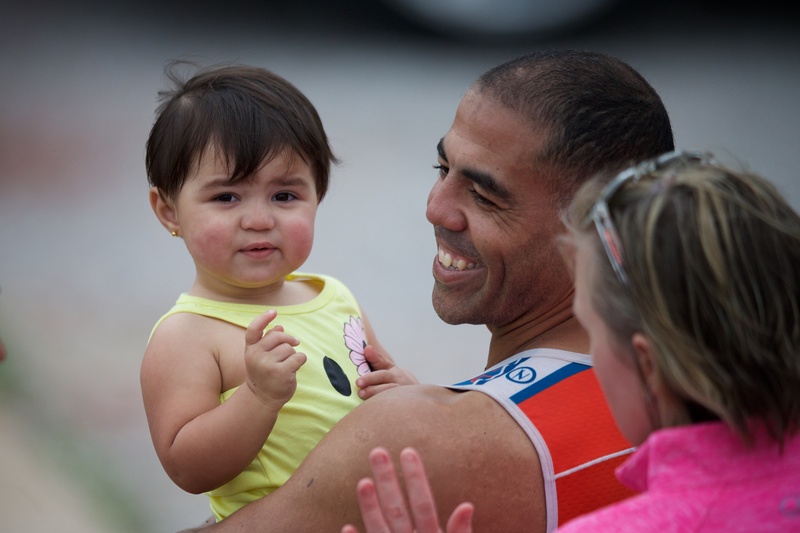 The Chris Brown Duathlon is a great introduction to multi-sport events for beginners. It is also a challenging opportunity for experienced and competitive athletes. 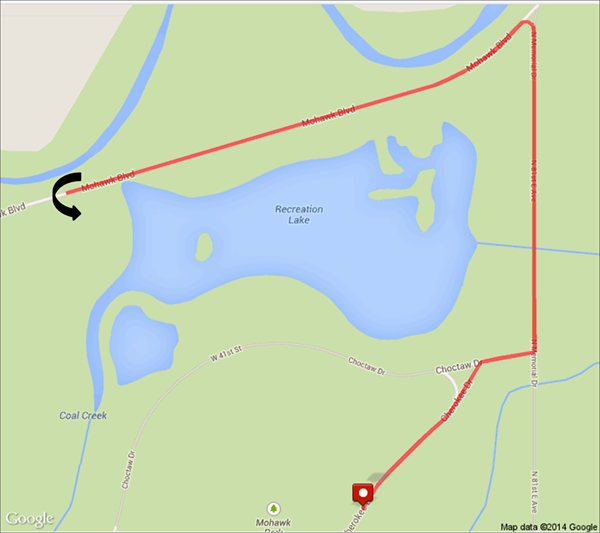 The Chris Brown Duathlon includes a 5km road run, 30km road bike, and another 5km road run. The event is held at Mohawk Park in Tulsa, Oklahoma. The run course is fast and flat on a closed paved road within Mohawk Park. The bike course is relatively flat with only a few rolling hills along the city streets of Tulsa. 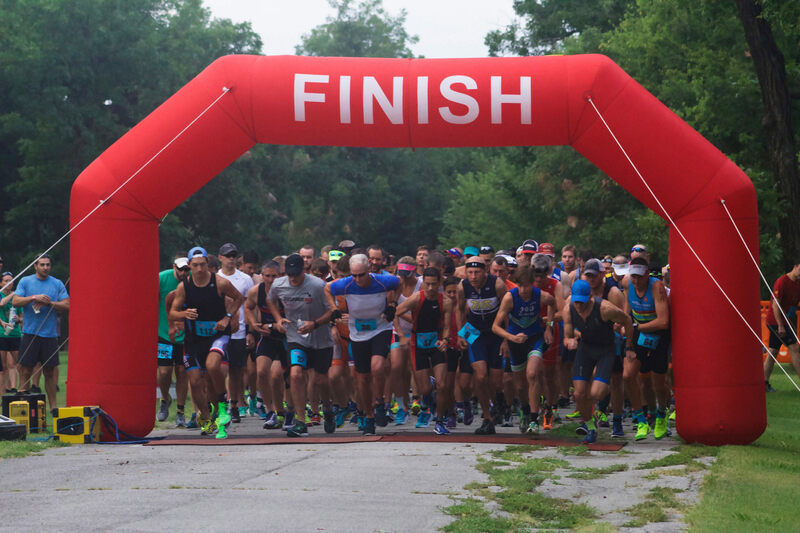 The Chris Brown Duathlon is hosted by Tulsa Area Triathletes and produced by RunnersWorld Tulsa Racing. We couldn't have such great races without our exceptional volunteers. 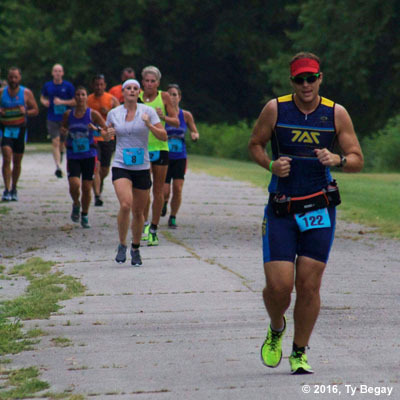 If you are not racing then sign up to help and you'll receive a 30% discount coupon at RunnersWorld Tulsa. 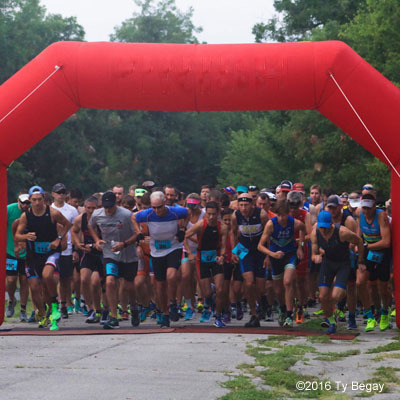 Check out other multi-sport events hosted by Tulsa Area Triathletes. We'd love to see you in Tulsa for more events like this. Only the participant can pick up their packet. Participants must show photo ID and proof of USAT membership. The Chris Brown Duathlon starts with a 5K run on paved streets within Mohawk Park. All streets are closed to public traffic. The course is a flat out-and-back. There is an aid station at the turn around and the course is easy to navigate. The third leg of the Chris Brown follows this same course. Click on the map to the left for a larger view of the run course. 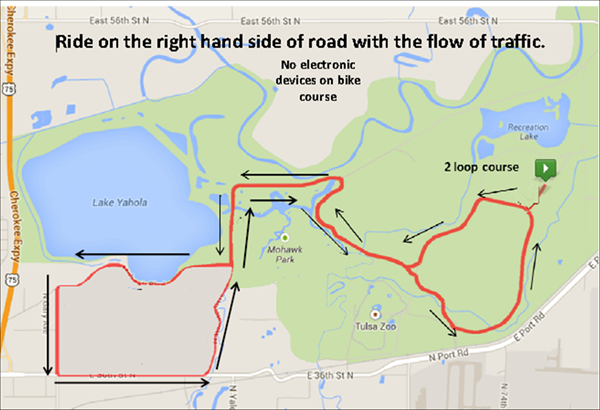 The 30K bike course is a two loop course primarily inside Mohawk Park. All streets are open to traffic and cyclists must obey all traffic laws. Volunteers and law enforcement will be on the course to assist with traffic and instructions. Click on the map to the left for a larger view of the bike course. The Chris Brown Duathlon provides many opportunities for friends and family to watch you perform. The transition area near Shelter 6 is a great place to watch and cheer participants as they transition from one segment to another. Athletes make two loops on the bike course on the main road near Shelter 6. This is a great place to see all the competitors in action. The finish line is next to the transition area. Spectators are asked to stay off the course to reduce traffic. Spectators are not allowed to provide any aid or assistance to participants during the race. Pacers are not allowed on the course at any time. Outside support will result in automatic disqualification. More cowbell is always welcome. Our races are manned by the best volunteers in the area. Most are triathletes, runners, swimmers or bicyclists. 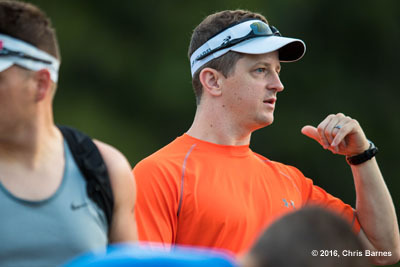 The Chris Brown Duathlon wouldn't be possible without the help of great volunteers. Sign up for a shift at our VolunteerSignup website. Don't worry if you are new to the volunteer scene. You'll be working alongside and learning from the best of the best. To show our appreciation each volunteer will receive a 30% discount coupon from RunnersWorld Tulsa. 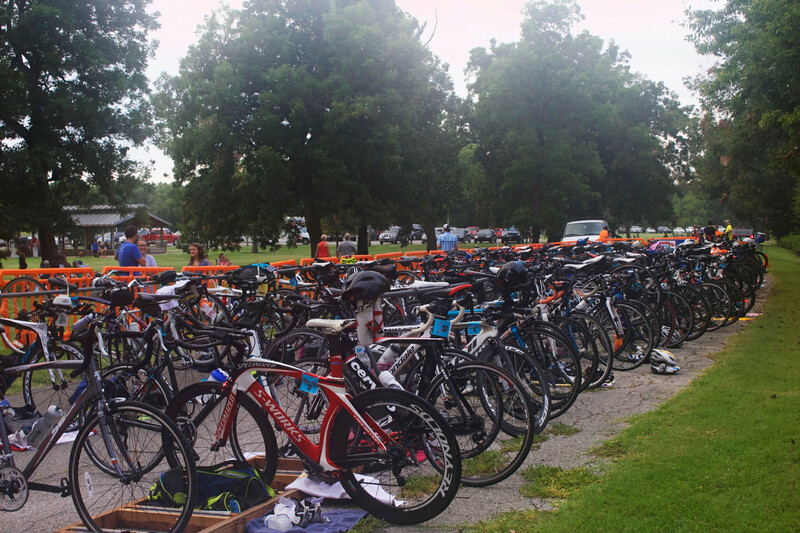 Be familiar with USAT Triathlon rules and regulations. Pay extra attention to some of the most common rule violations on our warnings page. Read our TAT Race Tips and Advice page to be ready for the Chris Brown Duathlon. Unsportsmanlike-like conduct directed at race officials, USA Triathlon officials, volunteers, spectators or fellow athletes is forbidden and will result in disqualification. Shirts and requested sizes are only guaranteed if you register prior to May 15, 2019 due to ordering and production timelines. After May 15 shirts will be available on a first-come basis. This is a USAT sanctioned event. 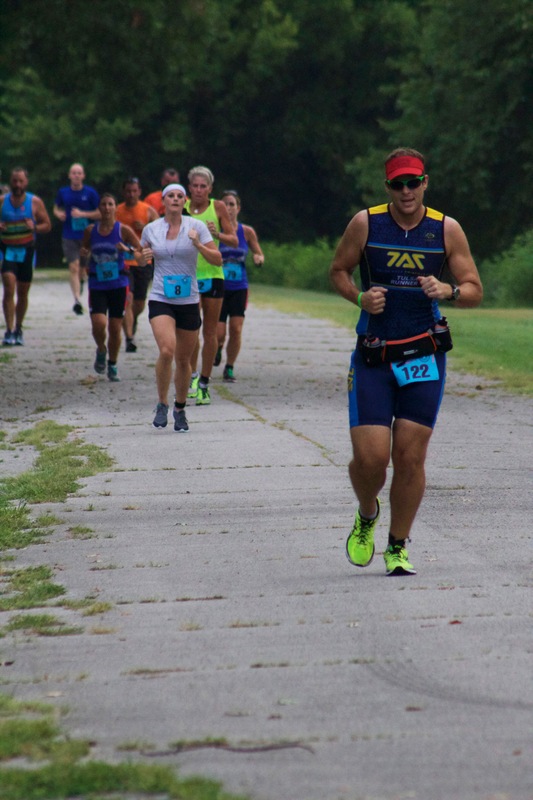 All participants must be a USAT member – annual or one-day. One-day memberships are available with sign-up. No race day packet pickup. 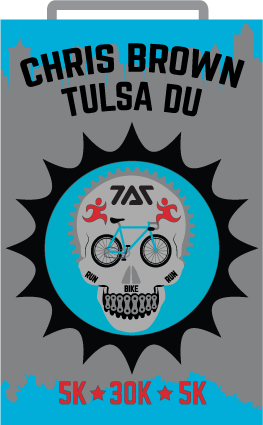 If you live more than 40 miles from Tulsa contact the race director to be placed on an exception list. Parking is available in the parking lot near Shelter 6. Parking will also be available one one side of Cherokee Drive where a parking assistant will help you. You must be completely off the paved road for the safety of our athletes. Do not cross any cones or barricades to park since our transition area and course need to be clear of obstructions and hazards. Chris Brown Duathlon is a Champion Chip timed event. Participants must pick up a timing chip on race day and wear it on your ankle the entire race. It will be removed at the finish line. 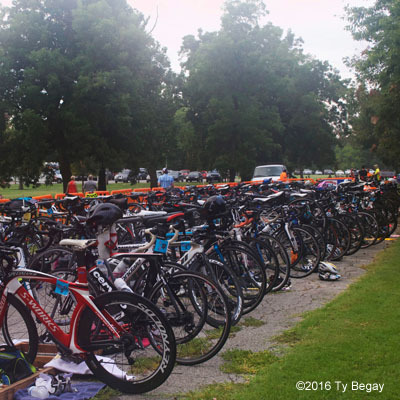 There is limited space in the transition area so please rack your bike according to our TAT Race Tips and Advice page. The bike course is on open roads with active traffic. No Earbuds, headphones or similar devices during the bike or run. Participants are responsible for knowing the course. If you drop out of the race please return the timing chip to the finish line. You will incur a $35 replacement fee if the chip is not returned. Preliminary race results will be posted at the finish line during the event. Final results will be available after the race and submitted to USAT. No transfers and no refunds if you are not able to participate.